The Hunter is the kind of film that will enthrall many audiences and infuriate others. It’s an intelligent and well-crafted exercise in combining elements from several different genre repertoires and presenting them via great cinematography of relatively unusual landscapes. The performances are very good and there is an engaging sense of suspense. The film’s resolution will provide many audiences with the basis for arguments in the pub, although the script in the end is the weak point as it rushes to its conclusion with several narrative threads dangling. But this shouldn’t detract from the pleasure of watching the film in the cinema (and not waiting for it on DVD). 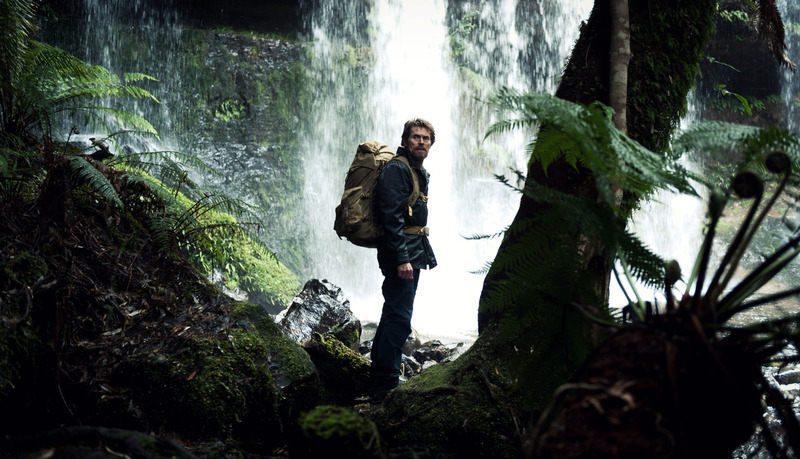 ‘The hunter’ is a professional and at first we think he is a typical Hollywood/European hitman as he receives a commission – but quickly we realise that we have the wrong genre and instead we are plunged into a Deliverance-type story, set in an isolated part of Tasmania. ‘Martin David’ (Willem Dafoe) is given the task of finding the last surviving specimen of the supposedly extinct Tasmanian tiger in order to kill it and retrieve blood samples and organs which a typically mysterious corporation (‘Redleaf’) intends to use to develop new biotechnology products. The tiger’s last sighting was in a mountain region where a dispute about logging on the lower slopes between local loggers and a group of ‘eco warriors’ means that the hunter is less than welcome in the bar of the nearest town. However, unlike the hapless townies in John Boorman’s Deliverance, the hunter is highly capable of looking after himself and at times in the wilderness he resembles the John Rambo character in the first film of that series. However, The Hunter has another genre repertoire to explore. Martin’s cover story is that he is a university researcher and he has rented a room in a house in the forest owned by Lucy (Frances O’Connor) and her two small children ‘Sass’ and ‘Bike’. Lucy’s partner was a local scientist who disappeared on a trip into the wilderness. When he arrives, Martin finds Lucy crashed out on sleeping pills and he is greeted by the assertive Sass and her brother who refuses to speak but who has a remarkably expressive face. The narrative will allow plenty of time to explore the relationship between Martin and these children – and their mother when she eventually emerges. So, self-reliant, professional hunter seeks prey but also has to deal with a grieving family and a hostile local community. On top of this, we may be in an eco ‘conspiracy thriller’ concerning Redleaf. It’s a fascinating mix and director Daniel Nettheim, cinematographer Robert Humphreys and composers Andrew Lancaster, Michael Lira and Matteo Zingales generally succeed in presenting a compelling narrative. It’s unfortunate that they never solve the central problem associated with a narrative built around two very different generic modes – the hunter in the wilderness and the family melodrama in the boarding house. It’s not that the two narrative strands aren’t connected – Martin builds a relationship with the mute boy that clearly has a relevance for his task in the wilderness. Rather it is the problem of frequent moves between the locations so that the mountain range where an extinct animal might have been spotted seems only a few miles down the road by car. The script by Alice Addison appears to have been developed from a previous adaptation of a novel by Julia Leigh, who last year saw her own film, Sleeping Beauty in competition at Cannes. I haven’t read the novel but some of the comments on The Hunter suggest that it doesn’t succeed in presenting the full complexity of the original story. I can only guess budget considerations and the possible uncommercial length of a ‘faithful adaptation’ gave rise to the compression of the film narrative in its final quarter. I can’t explain more without giving away the plot twists. My advice is to sit back and enjoy the film for what it is – an engaging twist on familiar genre narratives with great performances (Dafoe is perfectly cast) – but don’t try to second guess the plotting. This entry was posted in Australian Cinema and tagged conspiracy, eco-warriors, thriller. Bookmark the permalink.